Causalgia is a rare pain syndrome related to partial peripheral nerve injuries. The peripheral nervous system encompasses nerves that extend from the central nervous system of the brain and spinal cord to serve limbs and organs. 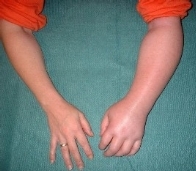 Severe cases are called major causalgia. Minor causalgia describes less severe forms, similar to reflex sympathetic dystrophy (RSD). RSD includes muscular and joint pain symptoms, and changes in bone density. Causalgia is usually caused by brachial plexus injuries, involving nerves that run from the neck to the arm. The disruption of neural signals causes pain and increased release of the neurotransmitter norepinephrine, which causes vascular symptoms. 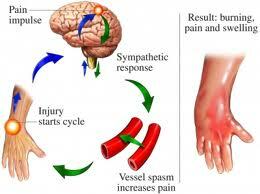 Symptoms usually involve burning pain prominent in the hand or foot within 24 hours of injury. Almost any sensory stimulation worsens the pain. Vascular changes include either increased or decreased blood flood due to dilation or constriction of blood vessels. Other symptoms include dry, scaly skin; still joints; tapering fingers; ridged nails; long, coarse hair or hair loss; and changes in sweating. Diagnosis entails a thorough medical history and physical examination. Physical exams can be difficult to perform due to pain. Medical therapy is usually ineffective. Sympathetic block, which involves a series of localized anesthetic injections to block certain signals from the sympathetic nervous system, brings lasting relief to 18 percent to 25 percent of patients. Surgical sympathectomy, or surgery to block certain nerve signals, brings complete relief to more than 80 percent of patients and relief of sympathetic symptoms to 90 percent. Similar results are found among patients with reflex sympathetic dystrophy. Techniques used include anterior thoracic, thoracic endoscopy, percutaneous radiofrequency and supraclavicular. The risk of significant complication is approximately 5 percent. Risks include collapsed lung, pain in the rib area, spinal cord injury, and Horner’s syndrome. Symptoms of the syndrome include drooping eyelid, contracted pupils, absence of sweating and receding eyeball. Copyright © 2017 Dr. Arun L Naik. All Rights Reserved.